The U.S. Coast Guard Officer Candidate School (OCS) is located at the Coast Guard Academy in Connecticut. The 17-week course prepares potential commissioned officers of the Coast Guard to assume the responsibilities of an officer upon graduation. Attendance of an OCS is limited to civilians who have a four-year college degree and enlisted members of the Coast Guard with a baccalaureate or higher. Coast Guard OCS is a highly-specialized 17-week course that is held twice a year, in January and August. 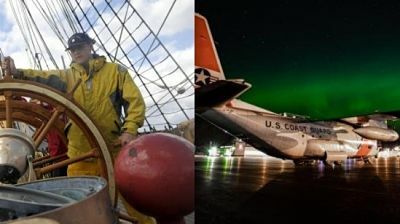 Overall, instruction includes leadership development and management with an emphasis on Coast Guard missions, nautical science, and fundamental military training. Upon completion of Coast Guard OCS, graduates are commissioned at pay grade O-1 (Ensign). In the final weeks of OCS, candidates will compete for available positions upon graduation in one of four main operational specialties including afloat, aviation, prevention, and response. Available choices typically include assignment to Coast Guard Sector Prevention which focuses on the duties and responsibilities of a prevention officer or an incident management officer; Coast Guard Sector Response which includes search and rescue, law enforcement, pollution investigation, incident management, and Captain of the Port authority; Coast Guard Cutter which includes the responsibilities of a deck watch officer or an engineering officer in training; and Aviation which is a training billet to become a Coast Guard pilot. The Coast Guard has two OCS programs: Officer Candidate School Reserve Commission (OCS-R) and Temporary Commission (OCS-T). Individuals who are already serving in the Coast Guard and rank E-5 and above may apply for either OCS-T or OCS-R (but not both) while OCS-R is the only program for civilians. Though the course material is the same, the difference is status following the initial four-year contract as a commissioned officer. For civilians, OCS-R means that you are a reserve officer on active duty for the first four years after receiving your commission. If you are promoted within four years, you are then considered active duty; however, if you are not promoted within that time frame then you will be discharged. For enlisted service members, OSC-T means that you are a “temporary” officer for the first four years after receiving your commission. If you do not get promoted within that time frame, then your status reverts back to enlisted. For both OCS-R and OCS-T, applicants must first speak with his or her local recruiting office to receive details regarding deadlines, notification and hire dates, plus other program-specific information. Find your local Coast Guard recruiter’s office. View the list of requirements and learn more about the Coast Guard OCS. Learn more about Officer Candidate and Training Schools.